Camelot Unchained will launch a closed beta on July 4, 2018. The crowdfunded MMO—which hails from one of the designers of Dark Age of Camelot—raised $2,232,933 way back in 2013, but its since been plagued by delays. Talking to Eurogamer, developer Mark Jacobs, who was lead designer of Dark Age of Camelot and Warhammer Online, said that Beta 1 should not be confused with any kind of Early Access release, which "would be abusing what Early Access on Steam is meant to be." Beta 1 will only be available to those who backed $50 or more on the Kickstarter, and players who have pre-ordered the game. 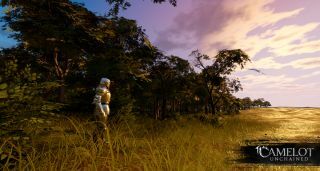 This first beta, which the Kickstarter spec had originally pencilled in for February 2015, intends to test Camelot Unchained's core mechanics, including combat at the closed arena Saturday Night Sieges and across the open-word Contested Islands. You'll also get to experiment with building and crafting, too. While the original timescale has now been and gone, the team is looking to release sometime in late 2019.